Harold Burson yesterday delivered a moving tribute to his wife of more 60 years, Bette, who died Sept. 16 at the age of 85. In that heartfelt talk, Burson clearly showed that PR's power comes from storytelling, not from the latest social media development or “scientific” tool designed to measure results. Burson, 89, charmed the more than 500 people at City College of New York’s Graduate Center by simply telling the story of his life with Bette. It was a story well told. It was powerful PR. Bette attended Katherine Gibbs secretarial school and eventually worked with Harold when he opened his PR business. She left after five years upon giving birth to their first son. Burson called himself a “weekend father,” especially when he saw the potential to build Burson-Marsteller into a global powerhouse. He gave Bette all the credit for raising their sons during the turbulent 1960s and '70s, keeping them on the straight and narrow. “I took care of business. She took care of the family,” said Burson. The day of the check-up, Burson had a board meeting in D.C. He had offered to go with Bette to the doctor, but she had a ride and didn’t think Harold’s presence was necessary. After receiving the call about Bette’s inoperable brain tumor, Harold rushed home to Scarsdale. Bette was given six months to live. 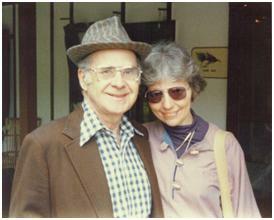 Bette and Harold decided that she would not seek treatment for the tumor. They were told that treatment would add only two months to Bette’s life. Burson said Bette lived life to the fullest for the first three months, but later struggled, especially after the ever-talkative Bette lost the ability to communicate. Burson said his wife wanted to be remembered with “cheers, not tears.” A champagne toast to Bette Burson capped the celebration of her life. Harold deserves a toast from the PR community for being one of its all-time best. His kind is rare these days.